Welcoming a baby is a transformational experience for the entire family, including your partner, so it is only natural to prepare for this milestone event. As an expectant mother you are probably already researching various ways to get ready for birth so you can feel confident on the big day. But what about your partner? Is he or she ready for the delivery room? Can your spouse confidently support you during birth? Here are 5 ways your partner can prepare for birth! #1 – Attend Prenatal Appointments Together! Many partners attend the ‘important’ prenatal checks, like the first appointment or the 20-week ultrasound, which is so meaningful. But if at all possible, try to attend as many, if not all, prenatal care appointments together. This enables partners to be more engaged in the care mom is receiving, and gives spouses an opportunity to ask questions, and to share a voice in the healthcare decision-making process. Going to appointments helps partners foster a strong rapport with mom’s primary healthcare provider, or can offer a great opportunity to meet various providers if you are seeing a group practice. #2 – Consider Individual Desires and Preferences! The Coach – This type of birth partner wants to be the primary support person for Mom during labor. They are comfortable taking on a strong advocacy role during birth and desire to be a leader for mom in the delivery room. The Cheerleader – This style of birth partner is more comfortable in a teammate type of role. They usually want to support and help mom during labor and birth, but they are also looking for guidance and support from healthcare providers, as well. The Watcher – Many birth partners prefer being an observer or witness at birth. They want to be present at the birth of their baby, but may not be comfortable or equipped to provide high levels of emotional or physical support to the laboring individual. Understanding the common roles birth partners can play and engaging in a discussion about this throughout pregnancy helps couples set realistic expectations for the type of support they can give. #3 – Take a Comprehensive Childbirth Education Class! Modern childbirth education classes are designed for both parents to attend. Expectant individuals tend to self-educate about pregnancy and birth, but it is not as common for birth partners to dig really deep into this topic. This is where a thorough childbirth course can be exceptionally helpful to parents. A high-quality independent childbirth education class gives couples valuable information, tips, tools, and resources to build their confidence an knowledge-base. Also prepared partners may be more comfortable in the delivery room and better capable of providing mom with the level of support she desires. #4 – Hire a Doula! Birth doulas provide physical, emotional, and informational support to both parents during labor and birth. Evidence overwhelming supports having a trained labor doula present at birth to improve outcomes for mom and baby and increase satisfaction for the entire family. A doula is especially useful for partners who are more comfortable in the ‘cheerleader’ or ‘watcher’ roles during birth. Your doula is a wonderful addition to your birth team and can help take the pressure off dad to ‘perform’, so he can truly enjoy the birth of his baby, and support mom to the best of his abilities and preferences. This conversation with Penny Simkin and Dr. Amy Gilliland discusses how partners and doulas work together during labor and birth. #5 – Create a Birth Plan Together! You may have the opportunity to go over your birth preferences with you doula or in a childbirth education class, but it is also a great idea to prioritize your birth desires as a couple. 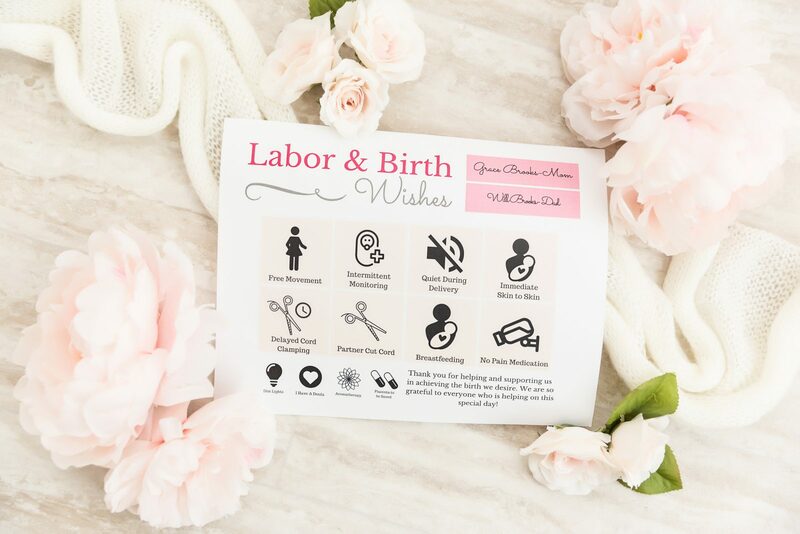 Creating and reviewing a birthing plan together serves as a wonderful tool to help you understand all of your labor, birth, and postpartum recovery options and desires. This birth plan checklist and template outlines some topics you may want to consider and include in your birth plan. What did you and your partner do together to prepare for birth? Is there anything you would suggest that Dad and partners can do to get ready for the big day? Nurtured Foundation serves the great Cleveland area with birth & postpartum services including: birth doulas, postpartum doulas, night doulas, placenta encapsulation, in-home lactation and in-home massage.